When Paris Wanjiru, a 17-year-old student in Muranga, Kenya, first saw the solar-powered lamp her mother bought, she was so excited she stayed up until 1 a.m. studying chemistry. Now that she can study after the sun sets, her grades have improved; she now aspires to study chemistry at Kenya University. Her mother, Nancy Wambui, 45, had saved for three months to buy the home solar system, providing the family with a personal power supply. Before, the family had relied on kerosene lamps for light, but their fumes are dangerous and they are costly to fuel — off-grid households spend about $200 a year on kerosene. Off-grid alternatives to energy access benefit more than just families. Farmers who use solar lights to display their crops at evening markets sell more than they otherwise would, says John Njorge, a local solar lamp vendor in Muranga. 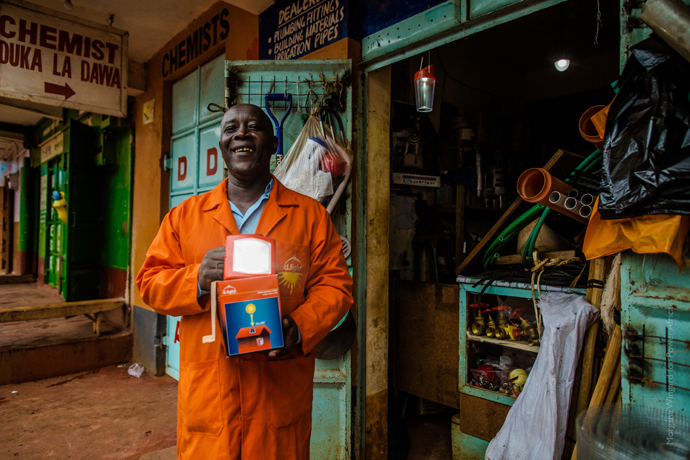 Even shopkeepers with access to the grid use solar kits to keep their business running during power outages. Besides providing school‐aged children with reading light, lowering household energy costs, and generating hours of productivity for businesses, these partnerships help generate income for small‐business owners like John. Paris and John are two of many benefiting from companies selling affordable energy access to people in remote communities in sub‐Saharan Africa where electric lines have not reached. In partnering with the private sector, President Obama’s Power Africa initiative aims to help companies like these realize their potential and scale access to modern lighting across the region — a key ingredient for spurring economic growth. The company d.light was co-founded by Sam Goldman, a former Peace Corps volunteer in Benin. After a neighbor severely burned himself from a kerosene lamp spill, Sam says he was determined to find a safer, more reliable way for rural people to light their homes. After meeting co‐founder Ned Tozun in graduate school, the two developed a prototype LED lamp that ran on solar power, and in 2008 d.light’s first commercial solar power lamp debuted on the market. Today, the company offers five off‐grid solar‐powered products that provide at least twice as much light as kerosene — and they’re cheaper and safe. The most affordable solar lamp goes for $5. 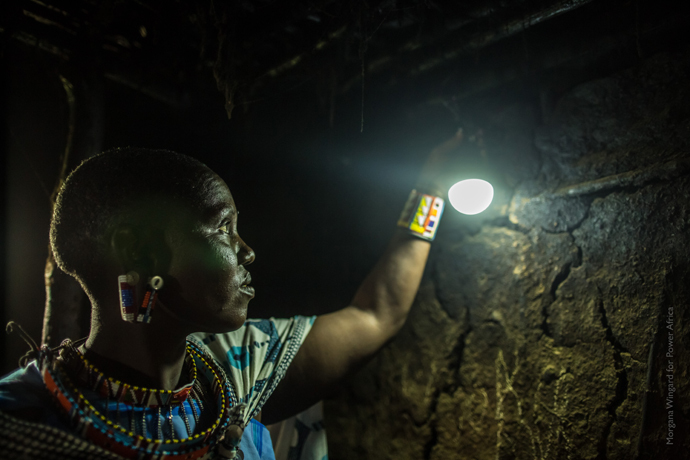 “Just as mobile phones adoption rates skyrocketed in the ‘90s, we see tremendous opportunity in the off‐grid solar market to enable consumers to secure basic energy access and radically improve their lives and opportunities,” Sam says. Justina Balankena is a Solar Sister entrepreneur and small business owner in Bomani, Tanzania, where she sells small solar lights and energy-efficient cookstoves. 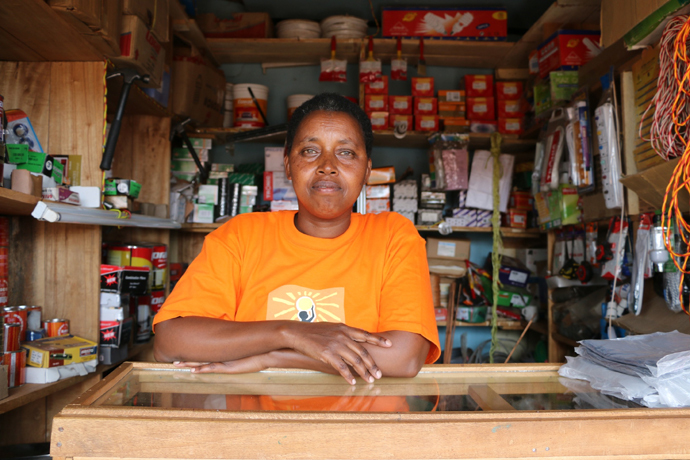 Justina’s store brings the benefits of solar technology right into her town. Solar Sister eradicates energy poverty in Africa by empowering women with job opportunities. The company uses a women-focused sales network, recruiting and training female entrepreneurs to sell solar lamps, mobile phone chargers and fuel-efficient cook stoves. Women like Justina Balankena, a small business owner in Bomani, Tanzania. At first, Justina’s customers simply weren’t familiar with solar power. 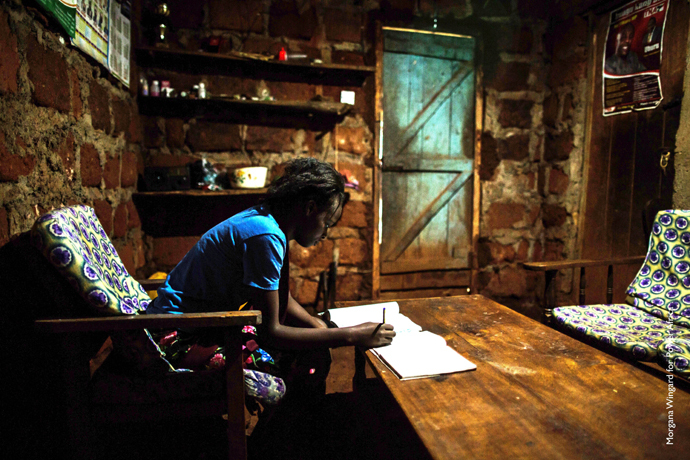 When the unreliable grid in town goes out, Justina switches on her solar lamps. Her little kiosk lights up. “When people pass by, they say, ‘There is no power here! How do you have power?’ So they come and ask. That is how we sell,” she explains. The store provides income for Justina’s family. It also brings her a strong sense of personal pride and independence. “I run the business. The advertisements are even in my name,” she says. Innovative energy technology, combined with economic opportunity, goes beyond measurable results and really transforms lives. M-KOPA helps assure poor families nervous about investing in a new technology that this is a risk worth taking. Enter June Muli, hired by M­-KOPA with one goal in mind: Establishing a real network of customer service. Raised in Nairobi, June joined as head of customer relations, making her the 10th employee. June is helping M­-KOPA build a spirit of “umiliki” — a Swahili word meaning “ownership” — in their community. M-KOPA boasts a 24-hour call center and uses a pay-as-you-go platform, allowing customers to pay for solar lighting systems over time via mobile phone. More than selling a product, M-­KOPA sells the vision of a better connected, more efficient Africa. “This starts with the human voice of a person and the real human connection,” June says. Rudy Gharib is the head of communications for Power Africa. Follow her @rudygharib and use #PowerAfrica to join the conversation.